Library image #2047: Johnson Lake in the Beaverhead-Deerlodge National Forest. The United States Congress designated the Anaconda Pintler Wilderness (map) in 1964 and it now has a total of 158,712 acres. All of this wilderness is located in Montana and is managed by the Forest Service. 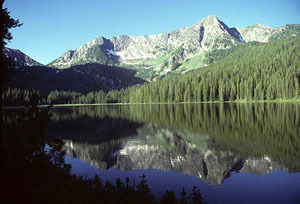 One of the jewels of the Northern Rockies, the Anaconda Pintler Wilderness, managed by the Forest Service, encompasses 158,615 acres in the Beaverhead-Deerlodge and Bitterroot national forests. It was designated in 1964, the year the Wilderness Act was certified. Terrain The Anaconda Pintler Wilderness straddles the Continental Divide along the crest of the Anaconda Range in southwestern Montana, positioned between the Bitterroot Valley to the northwest and the Big Hole Valley to the south. Streams and rivers drain to the Bitterroot and Big Hole rivers as well as Rock Creek. While the Anaconda Range’s permanent snowfields today are modest, the Wilderness protects a spectacular array of glacially carved landforms. These include tarn-pocked cirques, huge U-shaped valleys, knife-edged ridges (arêtes), and moraines. Elevations stretch from 5,100 feet along the canyon bottoms to 10,893 feet at West Goat Peak (one of several 10,000-plus-footers in the Wilderness). Geologically, the Anacondas include Precambrian and Paleozoic limestones, sandstones, and other sedimentary layers struck with igneous intrusions. Ecology Canyon bottoms support riparian forests and willow thickets, while vegetation on the mountain slopes ranges from sagebrush in the foothills through spruce-fir and pine forests to subalpine communities of quaking aspen, whitebark pine, and alpine larch. Along the high Divide, bare rock, tundra, and snowfields reign. Native wildlife includes many of the large mammals indigenous to the Rockies at the time of Euro-American settlement, among them mule deer, elk, moose, mountain goat, bighorn sheep, wolverine, gray wolf, puma, black bear, and the odd grizzly bear. The Anaconda Pintler Wilderness offers endless opportunities for outdoor recreation. U.S. Highway 93 and Montana Highways 38, 1, and 43 provide access to numerous trails. A 45-mile-long portion of the Continental Divide Trail cleaves the heart of the Wilderness. Backpackers should practice leave-no-trace ethics among the alpine lakes, which are sensitive to overuse. Mountaineering opportunities abound on the high peaks. Planning to Visit the Anaconda Pintler Wilderness? How to follow the seven standard Leave No Trace principles differs in different parts of the country (desert vs. Rocky Mountains). Click on any of the principles listed below to learn more about how they apply in the Anaconda Pintler Wilderness.